The Maid Narratives is a fascinating book that details the lives of servants and other domestic workers under the precedent of the Jim Crow laws in the South. The section of the book that focuses on the white folks’ narratives of the same time and in general the same experiences from a different vantage point, was very difficult for the authors to obtain. The reason for this lies in the difficult emotions that surround this hot topic. Were our sins so scarlet? Were our virtues so few? But did you hurt too and did we know it? This poem encapsulates the confusion and guilt that accompanies the fond memories of nannies and maids that white folk had as children. As adults, looking back, they can begin to understand that the people they remember fondly as someone who took care of them as they grew up were actually people being underpaid, mistreated, and generally oppressed. There is a cognitive dissonance between the fond memories they hold of their past and the truth that they now know as adults. Cognitive dissonance is a term that refers to the difference between two ideas that a person holds. For example, frequently, it is difficult for people who were children in the Jim Crow era to comprehend that their parents, especially those whom they viewed as kind hearted Christians, took part in such a systematic oppression of Blacks. There are such stark differences between the ideas of segregation and Christianity, that many are unable to understand how someone could support both. Many whites in the Jim Crow South who supported the Civil Rights Movement did so because of the cognitive dissonance between their religion and segregation. Even for those who were not children in the South during this period, there is still a level of cognitive dissonance that occurs. Actions that people viewed as the status quo of the time period can now be viewed as criminal oppression of a race. The guilt associated with this realization is too much for some to handle, and many refuse to speak on the subject. For this reason, the interviews with white families for The Maid Narratives were difficult to obtain. Anne Braden came to the realization that segregation was not acceptable quicker than most of her white counterparts, but even she did not challenge the system that bothered her so until she arrived at college at Randolph-Macon Women’s college in Virginia. Her cognitive dissonance was found in the difference between the way she had been raised, in a strictly segregated community, and the teachings of her religion. Anne, a devout episcopalian, eventually realized she could not ignore the differences between what she knew was right and how the world she lived in, the Jim Crow south, functioned. This realization led her to become an activist and supporter of the Civil Rights Movement throughout the rest of her life. 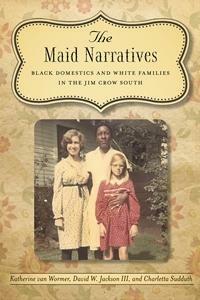 Wormer, K. S., & Jackson, D. W. (2012).The maid narratives: black domestic and white families in the Jim Crow South. Baton Rouge: Louisiana State University Press. I like that you included this poem. It echoes the feeling African-Americans felt when they were discriminated against. Could whites ever feel their pain? This question is answered with your discussion of Anne Braden, a woman who was a staunch advocate for the equality of African-Americans. Cognitive dissonance expresses the situation so well. Today older white southerners who grew up under the oppressive system of segregation and who followed the norms of seating arrangements on streetcars and buses and so on have to look back in wonderment that they abided by such rules. Even back then, there was this conflict in a supposed democracy. Behaviors and values were in conflict. Thanks for including my mother’s poem above which shows her regrets today at age 90. It’s great how you connected the poem with Anne Braden and the theme of cognitive dissonance, I enjoyed reading your post. Well done! Anne Braden– Anne and Carl Braden were in the forefront of the struggle for civil rights in the South many years before that cause became more accepted and then grew to a large movement that resulted in the major changes that began to happen in the 1960s. They were both persecuted by the FBI. I protested with them in Louisville and attended meetings in their home. They were inspiring and I am pleased at this recognition of Anne today.